Fences have many uses. Some of us use them for privacy. Others use them to secure a pool, yard, or garden from outside intrusion. And still others use them to give their pets a safe and sheltered area outside of the home. For homeowners with pets, a fence isn’t just a decoration – it’s a necessity. And for many of those homeowners, they’ve found the security they want for their pets with a vinyl fence from Future Outdoors. Vinyl fences are tough enough to stand up to abuse from animals and humans alike. That said, there are still a few things to consider when you’re looking at getting a vinyl fence to secure your pets. Especially if you have dogs, you’ll want to think about how aggressive they are to strangers when choosing a specific style of fence. If your dog is more aggressive, you’ll want to choose a fence type that blocks or limits outside visibility. The less your dog can see of the outside, the less aggressive he or she will be. For less aggressive pets, your options expand considerably. Semi-privacy fences allow some visibility through the panels while still maintaining security for your four-legged friends. These are good options for friendly or curious dogs that aren’t aggressive towards strangers. However, keep in mind that giving your dog an outside view might encourage him or her to try and escape the yard. Some dogs are loathe to let all four feet leave the ground at once, but others can soar gracefully through the air at surprising heights. 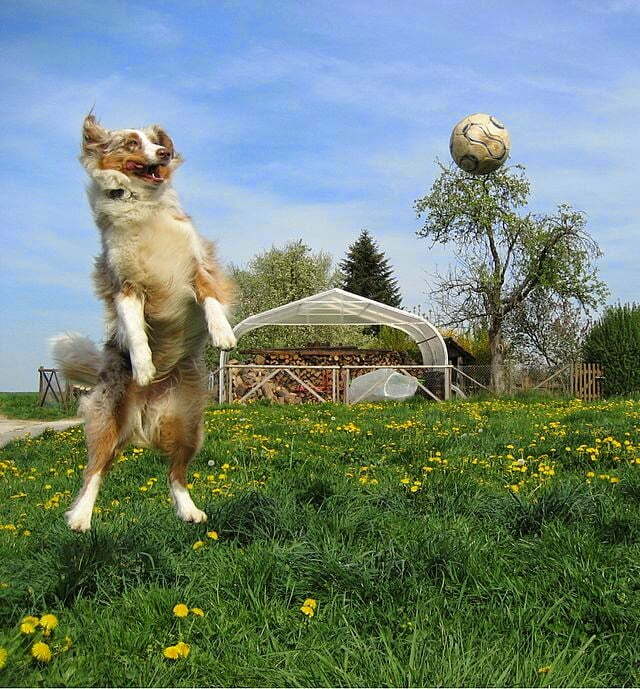 The world record for a dog jump is 68 inches from the ground – almost six feet! If your dog is one of these champion jumpers, you’ll need to keep their abilities in mind when getting a fence installed. For smaller dogs and those that aren’t so jump-happy, a fence that’s more than three or four feet high should be enough to contain them. Fences at this height come in a variety of styles, such as pickets, full panels, and semi-private fences with and without accents. However, dogs that can jump higher will obviously need higher fences. A six-foot privacy fence is generally enough to contain even the springiest of dogs. One other thing to consider when you have a jumping dog is that they may start a jump and get stuck. Fences with accents at the top, or picket fences with open slats, should be designed in such a way that your dog’s paws or head can’t get stuck. Another good idea is to outfit your dog with a quick-release collar when they’re in the yard by themselves. These collars break open under pressure, keeping your dog from getting trapped or strangled by them should they get stuck. Dogs don’t only escape over the tops of fences. If you want to make sure your dog is truly secure, or you already know that your dog is prone to digging, you’ll have to put some below-ground defenses in place when installing your new vinyl fence. There’s no one way to keep a dog from digging under a fence. Digging is an instinctive behavior and it can be tough to curb. For the most part, the only way to keep your dog from escaping under the fence is to install a barrier underneath the fence itself. One common solution is to bury a line of chicken wire under the ground at the bottom of the fence, with the sharp edges turned inwards. In most cases this should be enough to keep a dog from escaping – the wire is uncomfortable for them to dig against and difficult to break through. However, determined or especially strong diggers may need a tougher solution. In these cases, burying rocks or bricks under the fence, or even laying down a shallow concrete trench, can keep your pooch in his place. Another solution that we offer at Future Outdoors is a “dog board,” a vinyl board buried below the bottom edge of the fence that the dog can’t dig through. We bury this board when we build the fence, and it’s completely invisible once the fence is complete. Plus, since the dog board is vinyl, it won’t deteriorate from sitting in the ground (unlike a wooden board). Some dogs don’t try to escape, and instead choose to spend their outdoor time restlessly pacing up and down the fence line, looking for intruders or simply entertaining themselves. In these cases it can be best to choose a fence that offers a more limited view of the outside. This can help your dog calm down and also prevents other dogs, animals, or people from tormenting your pet through the fence. Another solution that can be helpful is landscaping on the inside of your fence line. Dense shrubs like holly or boxwood can force dogs away from the edge of the fence, reducing their urge to patrol. Additionally, shrubbery can help prevent jumpers and diggers from escaping by limiting their activity next to the fence itself. Vinyl fences are great for dogs, but they’re even better when you choose one that fits your dogs personality and habits. Talk to the experts at Future Outdoors, the number one provider of vinyl fences in North Texas, to see which fencing products are right for you and your pets. You can also follow us on Facebook and Google+ for more updates and information.